Lycoming County is a county located in the U.S. Commonwealth of Pennsylvania. As of the 2010 census, the population was 116,111. Its county seat is Williamsport. Lycoming County comprises the Williamsport, PA Metropolitan Statistical Area. Located about 130 miles (209 km) northwest of Philadelphia and 165 miles (266 km) east-northeast of Pittsburgh, Lycoming County is the largest county in Pennsylvania in area. Lycoming County was formed from Northumberland County on April 13, 1795. The county was larger than it is today. It took up most of the land that is now north central Pennsylvania. The following counties have been formed from land that was once part of Lycoming County: Armstrong, Bradford, Centre, Clearfield, Clinton, Indiana, Jefferson, McKean, Potter, Sullivan, Tioga, Venango, Warren, Forest, Elk and Cameron. Lycoming County was originally named Jefferson County in honor of Thomas Jefferson. This name proved to be unsatisfactory. The name change went through several steps. First a change to Lycoming County was rejected, next the name Susquehanna County was struck down as was Muncy County, before the legislature revisited and settled on Lycoming County for Lycoming Creek, the stream that was the center of the pre-Revolutionary border dispute. 1615: The first European in Lycoming County was Étienne Brûlé. He was a voyageur for New France. Brule descended the West Branch Susquehanna River and was held captive by a local Indian tribe near what is now Muncy before escaping and returning to Canada. 1761: The first permanent homes were built in Muncy. Three log cabins were built by Bowyer Brooks, Robert Roberts and James Alexander. 1775: The first public road is built along the West Branch Susquehanna River. The road followed Indian trails from Fort Augusta in what is now Sunbury to Bald Eagle Creek near modern-day Lock Haven. 1786: The first church built in the county was Lycoming Presbyterian church in what was known as Jaysburg and is now the Newberry section of Williamsport. 1792: The first sawmill was built on Lycoming Creek by Roland Hall. 1795: The first elections for Lycoming County government are held soon after the county was formed from Northumberland County. The elected officers were Samuel Stewart, county sheriff and the first county commissioners were John Hanna, Thomas Forster and James Crawford. Andrew Gregg was elected to represent Lycoming County in the United States Congress, William Hepburn was voted to the Pennsylvania State Senate and Flavel Roan, Hugh White and Robert Martin served as representatives in the Pennsylvania General Assembly. 1823: The county government funded the construction of the first bridges over Loyalsock and Lycoming Creeks. 1839: The first railroad is built. It connected Williamsport with Ralston in northern Lycoming County. The railroad followed Lycoming Creek. According to the U.S. Census Bureau, the county has a total area of 1,244 square miles (3,220 km2), of which 1,229 square miles (3,180 km2) is land and 15 square miles (39 km2) (1.2%) is water. Lycoming County is the largest county in Pennsylvania by land area and second-largest by total area; it is larger than the state of Rhode Island. Lycoming County is divided between the Appalachian Mountains in the south, the dissected Allegheny Plateau (which also appears mountainous) in the north and east, and the valley of the West Branch Susquehanna River between these. The West Branch of the Susquehanna enters Lycoming County from Clinton County just west of the borough of Jersey Shore, which is on the northwest bank of the river. The river then flows generally east and a little north with some large curves for 15 miles (24 kilometers) to the city of Williamsport, followed by the borough of Montoursville (both on the north bank) as well as the boroughs of Duboistown and South Williamsport (on the south bank). The river flows just north of Bald Eagle Mountain (one of the northernmost ridges of the Ridge-and-valley Appalachians) through much of its course in Lycoming County, but it passes the end of the mountain and turns south just before the borough of Muncy (on the east bank). It continues south past the borough of Montgomery and leaves Lycoming County, where it forms the border between Union and Northumberland Counties. From there the West Branch merges with the North Branch Susquehanna River at Northumberland, Pennsylvania, and then flows south to the Chesapeake Bay. Map of the West Branch Susquehanna River (dark blue) and Major Streams in Lycoming County, Pennsylvania. From west to east (left to right) the watersheds are: Pine Creek (red); Larrys Creek (orange); Lycoming Creek (yellow); Loyalsock Creek (green); Muncy Creek (light blue); and White Deer Hole Creek (purple, south of the river). The major creeks of Lycoming County are all tributaries of the West Branch Susquehanna River. On the north or left bank of the river they are (from west to east): Pine Creek (and its tributary Little Pine Creek) which the river receives just west of Jersey Shore; Larrys Creek, which the river receives about 7 km (4 mi) south of Salladasburg; Lycoming Creek which the river receives in western Williamsport; Loyalsock Creek which the river receives between Williamsport and Montoursville; and Muncy Creek (and its tributary Little Muncy Creek), which the river receives just north of Muncy. Loyalsock and Muncy Creeks are also the major watersheds of Sullivan County. Finally there is White Deer Hole Creek, the only major creek in Lycoming County on the right bank (i.e. south and west) of the river. It is south of Bald Eagle Mountain, and flows from west to east. The river receives it at the village of Allenwood in Gregg Township in Union County. Other creeks found on the right bank (south and west) of the West Branch Susquehanna River in Lycoming County are relatively minor, including Antes Creek in the Nippenose valley (in Limestone and Nippenose Townships), Mosquito Creek (at Duboistown), Hagermans Run (at South Williamsport), and Black Hole Creek (at Montgomery). The entire county is in the Chesapeake Bay watershed. The percent of the county drained by each creek's watershed is as follows: Pine Creek, 15.27%; Little Pine Creek, 11.25% (if these two are considered together, 26.52%); Larry's Creek, 7.17%; Lycoming Creek, 17.80%; Loyalsock Creek, 13.23%; Muncy Creek, 4.82%; Little Muncy Creek, 5.86% (if these two are considered together, 10.68%); and White Deer Hole Creek, 4.40%. Minor creeks account for the rest. As of the census of 2000, there were 120,044 people, 47,003 households, and 31,680 families residing in the county. The population density was 97 people per square mile (38/km²). There were 52,464 housing units at an average density of 42 per square mile (16/km²). The racial makeup of the county was 93.9% White, 4.3% Black or African American, 0.2% Native American, 0.4% Asian, <0.1% Pacific Islander, 0.3% from other races, and 0.9% from two or more races. 0.7% of the population were Hispanic or Latino of any race. 38.5% were of German, 11.7% American, 9.0% Irish, 7.4% Italian and 7.3% English ancestry. There were 47,003 households out of which 29.9% had children under the age of 18 living with them, 53.1% were married couples living together, 10.3% had a female householder with no husband present, and 32.6% were non-families. 26.9% of all households were made up of individuals and 11.9% had someone living alone who was 65 years of age or older. The average household size was 2.44 and the average family size was 2.95. In the county, the population was spread out with 23.3% under the age of 18, 9.7% from 18 to 24, 27.5% from 25 to 44, 23.4% from 45 to 64, and 16.0% who were 65 years of age or older. The median age was 38 years. For every 100 females there were 95.60 males. For every 100 females age 18 and over, there were 92.80 males. Lycoming County median household income was estimated, by the U.S. Census Bureau, as $46,663 in 2013. Statewide the median household income was $52,005 in 2013. In 2008, the state's median household income was $50,702. According to research by The Center for Rural Pennsylvania, which is a legislative agency of the Pennsylvania General Assembly, the poverty rate for Lycoming County was 16% in 2014. The statewide poverty rate was 13.6% in 2014. The 2012 childhood poverty rate by school district was: East Lycoming School District – 30.4% living at 185% or below than the Federal Poverty Level, Jersey Shore Area School District – 41.3%, Loyalsock Township School District – 29.2%, Montgomery Area School District – 42.7%, Montoursville Area School District – 22.1%, Muncy School District – 32.8%, South Williamsport Area School District – 34.3% and Williamsport Area School District – 62.5%. The child poverty rate is collected by the school districts as part of the federal free school lunch program. Lycoming County's live birth rate was 1,705 births in 1990. The County's live birth rate in 2000 declined to 1,339 births, while in 2011 it had declined to 1,279 babies. From 1960 to 2010, rural Pennsylvania has experienced an ongoing decline in the number of residents under 18 years old. Lycoming County had 980 babies born to teens (age 15–19) in 2011. In 2015, the number of teen births in Lycoming County was 904. There are also four Link libraries in the county. There are only two public use airports in the county. The Williamsport Regional Airport, has daily non-stop flights to Philadelphia, and a FBO for private jets and charters. There is also the Jersey Shore Airport, which only has a grass runway and can only handle light aircraft. Loyalsock State Forest in the eastern part of the county. 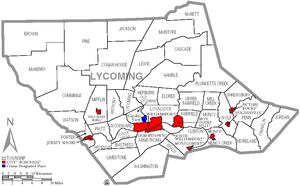 Map of Lycoming County, Pennsylvania with Municipal Labels showing Cities and Boroughs (red), Townships (white), and Census-designated places (blue). The population ranking of the following table is based on the 2010 census of Lycoming County. Act 13 of 2012, which levied a Marcellus Shale Impact Fee, was signed into law by Governor Tom Corbett on February 14, 2012. The bill provides for the imposition of an unconventional well fee by county (or alternatively municipalities compelling the imposition of an unconventional well fee). A county may impose the fee if unconventional gas wells are located within its borders and it passes an ordinance within 60 days of the effective date of Act 13. A county that did not pass an ordinance imposing a fee is prohibited from receiving funds. This prohibition remains in effect until a county passes an ordinance imposing a fee. In 2015, Lycoming County received an impact fee disbursement of $3,727,886.78 which was among the top seven counties receiving funds. The top county recipient was Washington County which received $6,512,570.65 in 2014. Cogan House Township received $798,627.10 making it one of the top seven receiving municipalities. Lycoming County had 877 marcellus shale wells. Cummings Township had 248 wells and Cogan House Township had 180 wells. In 2014, Lycoming County received an impact fee disbursement of $4,822,064 which was among the top seven counties receiving funds. The top county recipient was Washington County which received $6,512,570.65 in 2014. In 2014, there were 873 marcellus shale wells in Lycoming County. Cogan House Township was the top receiving municipality in Lycoming County getting $852,291.25. 2011 – 445 shale wells. Wikimedia Commons has media related to Lycoming County, Pennsylvania. ^ a b "State & County QuickFacts". United States Census Bureau. Archived from the original on July 14, 2011. Retrieved November 17, 2013. ^ a b c d e f g h i Robin Van Auken, Lou Hunsinger Jr. "Lycoming County: Williamsport Firsts". Williamsport Sun-Gazette. Archived from the original on 2012-02-09. Retrieved 2012-02-15. ^ University of Wisconsin Population Health Institute (2015). "Median household income". ^ "Pennsylvania Teen Births 2015". Robert Wood Johnson Foundation. 2016. ^ Leip, David. "Dave Leip's Atlas of U.S. Presidential Elections". uselectionatlas.org. Retrieved 27 November 2018. ^ The leading "other" candidate, Progressive Theodore Roosevelt, received 5,208 votes, while Socialist candidate Eugene Debs received 1,523 votes, Prohibition candidate Eugene Chafin received 423 votes, and Socialist Labor candidate Arthur Reimer received 3 votes. ^ a b "Find Your Legislator". The official website for the Pennsylvania General Assembly. Retrieved 2017-04-26. ^ Bureau, US Census. "Decennial Census by Decades". www.census.gov. Retrieved 27 November 2018. ^ Pennsylvania Utility Commission (2016). "Disbursements and Impact Fees 2015". ^ Pennsylvania Utility Commission (2015). "County Well Count Breakdown for 2014". ^ PUC (2013). "Lycoming County Total distribution for year 2013 :". ^ PUC (2012). "Lycoming County Total distribution for year 2012 :". ^ PUC (2011). "Lycoming County Total distribution for year 2011 :".